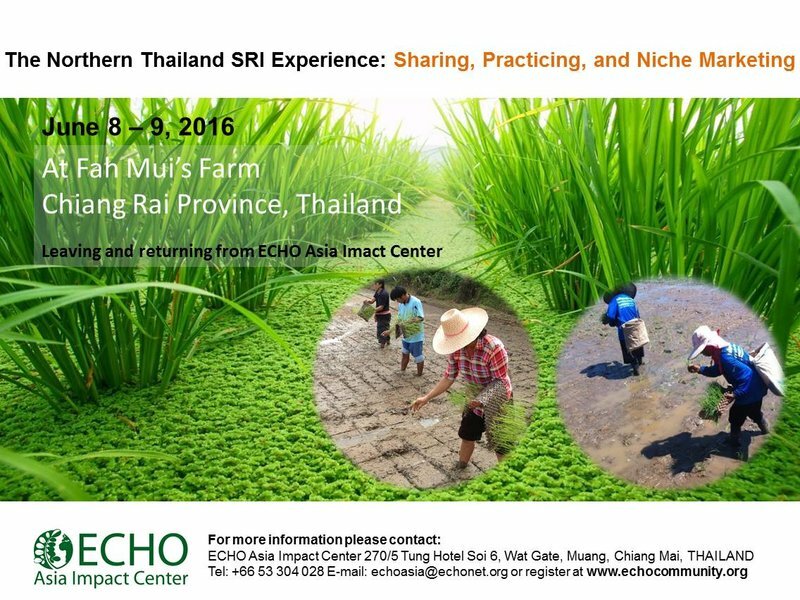 ECHO Asia in collaboration with Fah Mui Farm will organize a two-day "The Northern Thailand SRI Experience: Sharing, Practicing and Niche Marketing" workshop at Fah Mui's farm in Chiang Rai Province, Thailand during June 8 - 9, 2016. SRI has been promoted by academics, like Norman Uphoff, for several years, and many countries have adopted SRI as a way to reduce farmer-inputs and increase rice productivity. Several Thai farmers have learned and practiced SRI and are excited about sharing their experiences with others as a way to increase SRI adoption. Fah Mui is one such northern Thailand farmer who has successfully utilized SRI for several years. In addition to her environmentally-friendly rice culture, she has also created a niche market through her farm and ships the value-added rice all over Thailand. Even though SRI has many benefits for farmers, SRI still has several limitations that need to be discussed in detail, and farmers in northern Thailand also need to discuss the adaptation of SRI to the northern Thailand paddy context in order to find and share about the best SRI practices for specific contexts. Come learn and share with ECHO Asia, Fah Mui, and others about practicing SRI. Participant can pay by PayPal or bank transfer and will be invoiced separately. Two nights lodging will be provided. Transportation to/from Chiang Rai will be provided; participants will leave from Chiang Mai at 2PM on the afternoon of the 7th to spend the night in Chiang Rai, and will return the evening of the 9th.